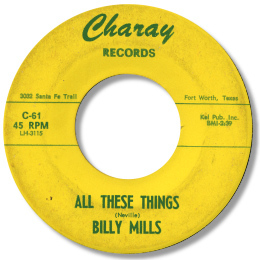 As one half of the duo Pic and Bill (Charles Pickens being the other) Billy Mills, reputedly born in North Carolina, recorded extensively for several of Major Bill Smith’s Fort Worth, Texas based labels, including Charay and Le Cam. Unlike his partner, Mills had a brief if interesting solo career. His first disc included a version of “Under The Pines”, a song that every black artist recorded by Smith seems to have recorded, backed by a very fine version of Art Neville’s All These Things, turning a typical Allen Toussaint New Orleans ballad into a more general southern soul cut of considerable merit. 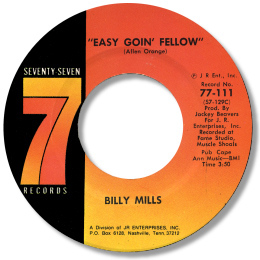 The big voiced singer joined John Richbourg in 1973 for a couple of 45s on his 77 imprint. Easy Goin' Fellow is a great bluesy version of the Roscoe Shelton hit, with his voice superbly set in a backing of horns, guitar and piano from the best studio in the South, Fame in Muscle Shoals. The flip “Sad Memories” is a more orthodox up-tempo soul performance, with Mills himself getting half share of the writing credit.